Oscilloscopes are one of the mainstays of an electronics lab and are essential for anyone designing electronics, troubleshooting, or working with high-speed electronics. Oscilloscopes are one of the few pieces of electronics equipment that plays multiple roles and can be used in the place of other electronics equipment. A number of types of oscilloscopes are available for the hobbyist and professional alike. 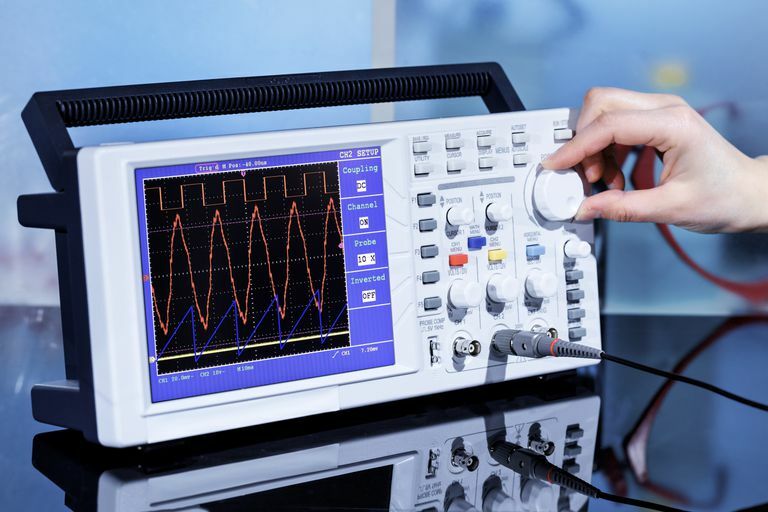 Several types of oscilloscopes are available, both analog and digital, across a very wide range of prices which can make selecting the right oscilloscope a challenge. Analog oscilloscopes are often used as key troubleshooting since digital oscilloscopes sample the signal, they can miss some transient signals which can cause erratic behavior which is why analog oscilloscopes are still prized for transient troubleshooting applications, although high-end digital phosphor oscilloscopes can provide similar capabilities. An analog oscilloscope directly displays the signal picked up by a probe and essentially trace it on the screen. Storage capabilities allow the waveform to be displayed for extended periods of type rather than decay immediately. Where analog oscilloscopes really come into their own is in dealing with analog signals and transient effects. Audio and analog video work are great fits for the capabilities of an analog oscilloscope which can also handle low-speed digital signals. Analog oscilloscopes do offer a better dynamic range than digital oscilloscopes and don't suffer from aliasing problems that can cause false readings on digital oscilloscopes. Analog oscilloscopes are generally more affordable than digital oscilloscopes and often essential for good troubleshooting and a great option for beginners and hobbyists. Digital oscilloscopes are available in a variety of types. Two key factors in the performance of digital oscilloscopes are their sampling rate and bandwidth. An oscilloscope's sampling rate will limit its ability to capture transient, one-time events and the bandwidth of an oscilloscope limit the frequency of repetitive signals that can be displayed by the oscilloscope. Most digital oscilloscopes are digital storage oscilloscopes. Digital storage oscilloscopes can capture transient events and store them for analysis, archival, printing, or other processing. They have permanent storage for recording signals and they can be offloaded to other media for storage and analysis on a computer. Digital storage oscilloscopes cannot display the level of intensity of a real-time signal, unlike an analog oscilloscope. Single shot events can be captured through the use of triggers which can be set manually or automatically depending on the oscilloscope. Digital storage oscilloscopes are the workhorses of real-world digital design where four or more signals are analyzed simultaneously. For higher speed digital signal capture and analysis, Digital phosphor oscilloscopes trump standard digital storage oscilloscopes. Digital phosphor oscilloscopes use a parallel processing ADC solution that delivers much higher sampling rates than traditional digital storage oscilloscopes. This sampling rate enables a signal visualization performance level that has the appearance of real-time. Digital phosphor oscilloscopes get their name from their similarity to analog oscilloscopes in displaying the intensity of a signal. In analog oscilloscopes, this is due to the phosphors on a CRT monitor glowing for a period of time before going dark which allows high-speed signals to build up a more intense glow in the areas they are the most and for transients to stand out as well. Digital phosphor oscilloscopes duplicate the effect of phosphorus by storing a database of the values of the repeating waveforms and increasing the intensity on the display where the waveforms overlap. Like an analog oscilloscope, a digital phosphor scope can reveal transients by displaying the intensity level, but it can still miss transients that happen outside of the data capture window and its update rate. Digital phosphor oscilloscopes combine the features of digital storage oscilloscopes and analog oscilloscope technology, making them great for general purpose design, digital timing, advanced analysis, communication testing, and troubleshooting. Combining an RF spectrum analyzer, logic analyzer, and digital oscilloscope and you get a mixed domain oscilloscope. When designing or working with systems that include digital signals, digital logic, and radio frequency communication, mixed domain oscilloscopes become an essential tool. The essential benefit of a mixed domain oscilloscope is seeing signals from each domain, analog, RF, and logic, time correlated to each other. This enables troubleshooting, debugging, and design testing that allows each signal to be correlated in time. Often the capabilities of a digital oscilloscope and logic analyzer are needed together, which is why the mixed signal oscilloscope was developed. The mixed signal oscilloscope combines a digital storage oscilloscope (or a digital phosphor oscilloscope) with a multi-channel logic analyzer. The digital triggering capability of the mixed signal oscilloscope aids the analysis of analog events that can trigger digital logic transitions. Typically mixed signal oscilloscopes only have two or four analog input channels and around 16 digital input channels. Digital sampling oscilloscopes have a slightly different input technique that other oscilloscopes and trades off a much higher bandwidth for a lower dynamic range. The input is not attenuated or amplified so the oscilloscope must be able to handle the full range of the input signal, which is generally limited to about 1-volt peak-to-peak. Digital sampling oscilloscopes only work on repetitive signals and will not help capture transients beyond their normal sampling rate. On the other hand, digital sampling oscilloscopes can capture signals that are an order of magnitude faster than other types of oscilloscopes, with bandwidths exceeding 80 GHz. Small handheld oscilloscopes are available for field and test applications where bulkier oscilloscopes are unwieldy or power is hard to find. They typically are limited to two inputs and are bandwidth and sample rate limited. One of the emerging types of oscilloscopes is the computer-based oscilloscope, usually an external device connected to a computer through USB. These types of oscilloscopes have made rapid strides in capabilities, increasing their sampling rates, bandwidth, and overall capabilities. Some systems approach the capabilities of low-end digital storage oscilloscopes for only a few hundred dollars and make great options for hobbyists looking for an oscilloscope. What Is kHz a Measure of in Digital Audio?